I’m sitting in traffic in Chicago. Apparently, it’s a mistake to be on the highway at this time of day, but my flight was delayed. Nothing like flying two states west when trying to go one state east. The Uber driver tells me we should take side streets. I oblige, he is friendly enough, but I’m eager to get to my hotel room to begin finalizing my attack plans for C2E2. 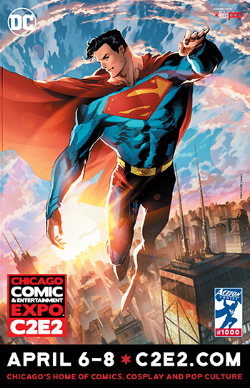 For those who don’t know, C2E2 is the Chicago Comic and Entertainment Expo, an annual event where people from all over flock to the Midwest in a comic book and pop culture-induced frenzy. This is my first time attending, and I’ve been plotting for months how to get the most out of my time. I’ve been to comic conventions in St. Louis, but this is my first large out-of-town convention. I have a few reasons for attending. Chiefly, I’m a massive comic book fan. So, being able to meet a plethora of creators is irresistible, and the celebrity appearances are pretty neat, too. But, if I’m being honest, the main reason I’m here is to network. My end goal is to find work, as a writer, in the comic book industry. As far as reaching out to make those connections, there is simply no better place to start than a con. So, after my Uber ride I head to the hotel bar and start typing away, plotting my plan of attack for the show. I’ve spent a decent amount of money getting here, as I’m sure other attendees have, and I’m trying to maximize my success. Below I’ve listed the key parts of my plan so far. C2E2 is just massive. I mean truly, for a first-time attendee, the programming has been almost overwhelming to just read, and trying to meld that information into a mental visualization has been, well, let’s just say staggering. So, I’m approaching the situation with the C2E2 app. It has super useful information and it’s constantly updating. I even used it to create an in-app schedule for which creators are signing at what times, which panels occur when and where, and what photo ops are going on. Both the app and website also have printable floor maps. Those have really helped me formulate a good game plan to find artist’s alley, the DC and Marvel booths, and the panels. They also have really useful things like coat check, check-in for badges, and even a quiet room to chill and decompress during a show. Most creators are apt to post their signing and appearance schedules on social media. These are really helpful in setting up a timeline for maximizing your fan time at the con. I’ve used Sean Gordon Murphy, Mark Millar, and several others to efficiently plot a course through the show floor map. Of course, this sounds super obvious, but by pack light what I really mean is bring luggage—that’s basically empty—for the swag you purchase at the con. Nothing says “I didn’t really plan for this” more than trying to shove super sweet lithographs and original art into your carry on. Also, and this is truly where I struggled, don’t bring all of your comic collection with you to get signed. I know this is counter intuitive to the core of fandom. I spent an entire week, with stacks of my super sweet comic collection spread out on the floor around me, agonizing which books I could bring with me and which books had to languish behind. I’ve got so many books by Brian Michael Bendis and Tom King, yet I tried to keep in mind that C2E2 had 80,000 attendees last year. Yes, you want to meet your favorite creators. Yes, you want to get your books signed. But you also want to keep the creators and other fans in mind and be considerate. Most lines have a max of items you can get signed. Remember, you are just one of myriad awesome fans that want to have a personal encounter with a writer/artist/celebrity/editor/colorist/letterer/cosplayer/etc. Be mindful of the time and excitement of your fellow fan. I’ve learned from following the social media feeds of various creators that there is this thing called comic con gunk. Basically, if you go to a mass event, you expose yourself to massive possible instances of contamination. Accordingly, I’ve been drinking an Emergn-C daily before each leg of the convention. I’ve got too much to do to come down with a debilitating affliction during or after the convention. So, when you see folks preparing for the zombie apocalypse, don’t shrug them off. Just preemptively medicate. This also seems obvious, but take a moment to think about why you’re attending. You’ve no doubt spent a decent amount of money to be here. Why? Is it to meet the creators or celebrities who bring your favorite characters to life? Are you here to showcase your killer cosplay outfit? Or are you here to network and try to meet people to sell you ideas to? Maybe it’s a bit of all or the above? Just remember, you’ve only got so much time at C2E2. There are a lot of panels focusing on important topics, as well as phenomenal cosplay tips. Know what you’re here for. Don’t get caught up in fandom if your goal is to find editors to pitch ideas. Again, if you’re here to solely get books signed, that’s great. If you’re here to meet potential prospects, that’s also great. Just be careful with your time. If you play your cards right, you can be a fan and a potential creator. Just do it properly. Going to a con can be overwhelming. Just remember, at the end of the day, you’re here to have a good time. Don’t get bogged down with ideas of what you should be doing. Have fun. Go meet other like-minded individuals. Get books signed, get commissions done, and grab a photo with your favorite actor. At the end of the day this whole thing is about enjoying fandom. So, do that. Don’t let some silly list dictate what you’re going to do. Enjoy yourself, plan your con, and make some memories. I’m posting this, but I will post a pre C2E2 post as well. I just want to share what my expectations were vs. the reality. Have a great weekend. See ya guys on Monday!